This week’s color combo at Stacey’s Stamping Stage was a tough one! I’m sure you’ll understand when you see the colors we played with! I didn’t have trouble finding paper for the first four colors, but the pink had me stumped! I guess it’s because of how the orange and black had me thinking of Halloween! I used paper from Cosmo Cricket’s Haunted collection (I guess I had to work that in somehow)! Other supplies: Karen Foster gem brad, Prima e-Line pearls, Basic Black ink from Stampin’ Up!, Border punch from Martha Stewart, ribbon, “Elegant Thank You” stamp from Stampin’ Up! I love these challenges because they get me making new things in colors I wouldn’t normally put together! so beautiful, Suzanne! love the elegance of this:) thanks for playing along at the Curtain Call! Great use of the colors this week. Thanks for playing along with the Curtain Call this week. This is so clean and elegant! 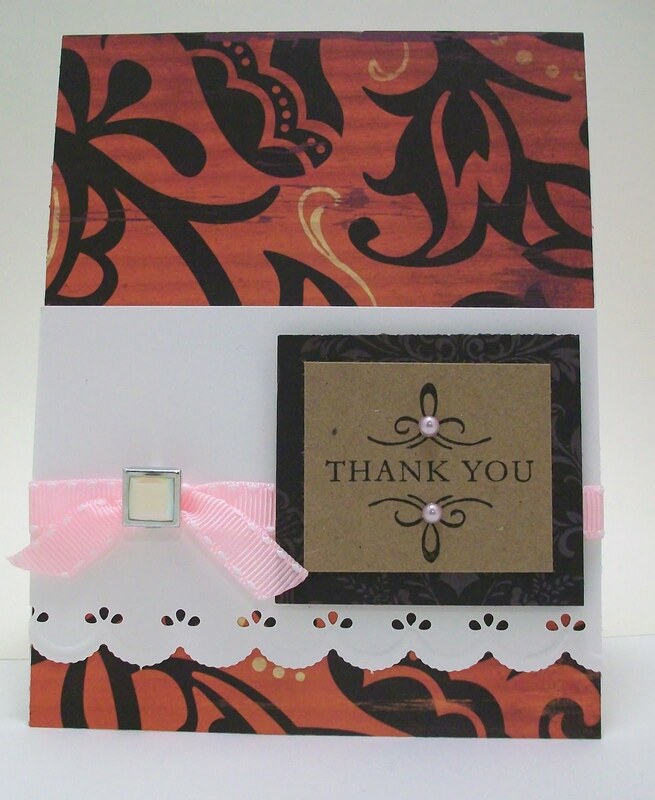 I love that sentiment block…the pearls are the perfect touch! Thanks for joining us at the Curtain Call this week!